Excellent maroon all steel body with maroon and gray cloth interior, Mustang II front suspension, Ford 9" rear end, reliable 289 cubic inch Ford motor, Ford C-4 automatic transmission, power brakes, tilt column, column shift, drivers side power seat all with about 28,000 miles since first built. The following has recently done and has very few or zero miles, all new interior, new turbo dual exhaust with stainless extensions, all new wiring front to rear, new MSD electronic ignition, new centerline light weight aluminum wheels, new BF Goodrich radials, AM/FM, new Sony CD changer, new speakers and new power antenna. 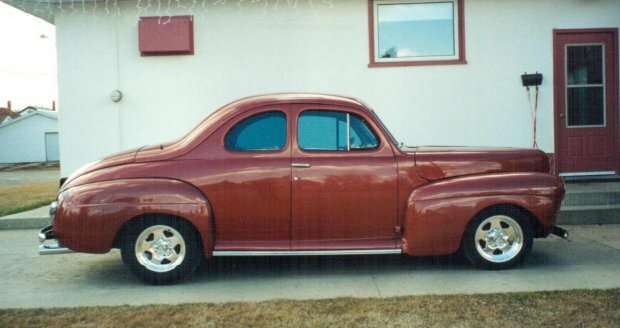 This is a proven trouble free car that has performed flawlessly and is ready to cruise, fly in and drive home with confidence and comfort in a street rod that is sure to appreciate in value.